Minarik Drives' RG5500U drive is a full-wave, four-quadrant regenerative drive which provides smooth motoring and braking torque for SCR brush-type DC motors. It controls motors from 1 through 5 HP for single or bi-directional variable speed. Applications with overhauling loads, rapid deceleration, basic positioning and high duty cycle reversing and braking benefit from this versatible regenerative drive. Slide switches allow the RG5500U to accept 115 or 230VAC input to run 90 or 180VDC motors. If you require better than 1% (armature mode) or .1% (tachometer mode) speed regulation, then you can use the DLC600 digital controller to get .01% speed regulation of set speed! The RG5500U is excellent for leader/follower applications as well. It acccepts almost any external signal input and is your answer for a full featured regenerative drive requirement. Isolated inputs: Accepts floating or grounded signals of -250 to +250VDC, -25 to +25VDC, 1-5mA, 4-20mA or 10-50mA. Burr Brown isolation has .01% linearity. User adjustable calibration pots: IR compensation, min speed, max speed, forward acceleration, reverse acceleration, forward torque, reverse torque, deadband.input adjust (for speed reference input) and tachometer. Stopping Modes: Coast to stop (N.O.) or regenerative brake (N.O. use 201-0024 plug with 18'' leads) decelerate to zero speed (N.O.). 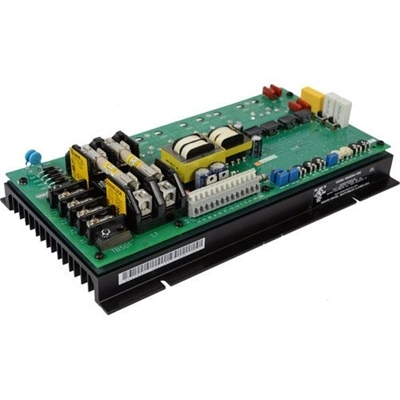 Additional features: Dual voltage AC input, on-board fusing.